I remember the first time I tried this dessert… It was love at first bite. Two delicate layers of crispy, buttery phyllo dough, cut thin like vermicelli noodles, and a luscious creamy interior all drenched in a sweet syrup. So simple and elegant. It took me years to try and replicate this dish, but three weeks after my daughter was born it was time. It took me two more tries to get the perfect recipe and here it is. I took the liberty of being creative with the filling. Traditional versions of this dessert are filled with either cheese, custard, or nuts. I decided to create a cream spiced with cardamom and orange. Hope you love it as much as I do! Heat 3 cups of milk, cardamom, sugar, and orange zest in a small pot over medium heat, stir occasionally until sugar is dissolved. Let mixture simmer for 5 min. Meanwhile in a cup dissolve cornstarch in remaining milk. Add cornstarch to simmering milk, while stirring constantly to avoid any lumps. Bring to a boil, stirring often, and cook for 5 min. Remove from heat. Strain mixture into a glass bowl. The filling can be made a day ahead, just cover surface with plastic wrap and refrigerate. Heat oven 350 F. If using frozen dough, follow instructions in the package (thaw overnight or 8hrs in the fridge). I like to remove mine from the fridge 2 hrs before use. With your hands, kitchen scissors or food processor cut the long strands of dough into 1 inch (~2 cm) strands. In a bowl mix dough, sugar, and melted butter. Make sure sugar and butter are well distributed. If using a food processor you can pulse in the butter and sugar. Generously butter a 10″-diameter springform pan. Evenly distribute 2/3 of the shredded dough mixture on the bottom and sides of the pan. With wet hands press the dough to make sure it’s compact and even. Pour the cream filling onto the phyllo dough, using a spatula spread cream evenly, leave a 1″ gap away from the sides of the pan. Layer the remaining third of the dough on top of the cream. With wet hands press down on the dough until it’s even, this will push the filling to the sides. Distribute the remaining soft butter, in 1/2 tbsp size dollops, on the top layer. Bake for 40-60min (time will vary depending on your oven). In a small saucepan combine sugar and water, heat over medium heat. Boil for 5 minutes. Add lemon juice and let boil for 1 more min. Remove from heat and add orange blossom. Let cool to room temperature. 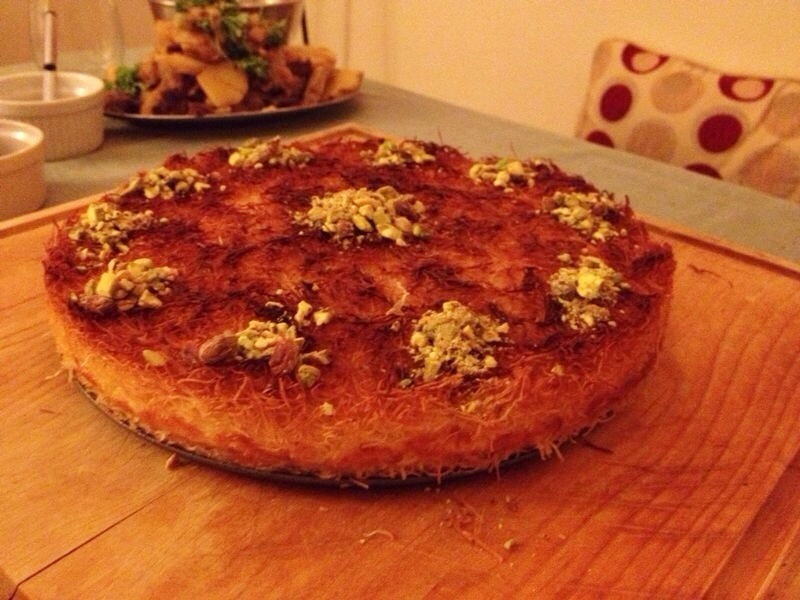 Let kunafa stand for 10 min before serving. Invert the kunafa unto a serving platter. 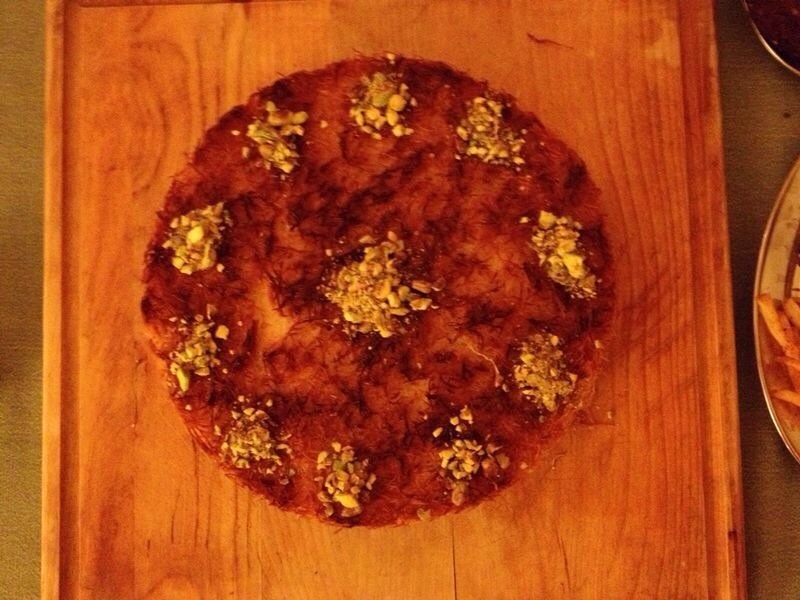 Decorate with ground pistachio. 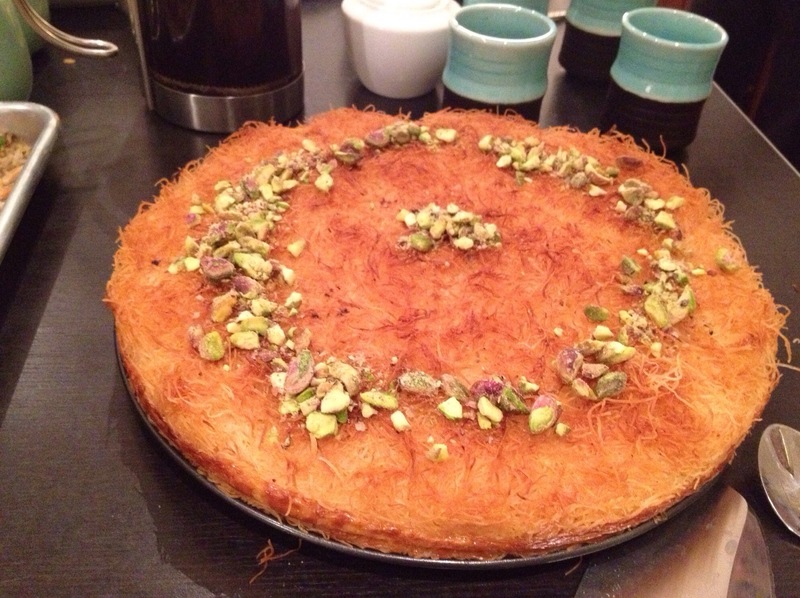 You can pour the simple syrup over the entire kunefa or let guests drizzle on their individual portion. I was hoping to make this wonderful sweet to bring when I break fast with friends in June. Will it work well to prepare ahead of time? May I prepare it but not bake it and then bake at my friend’s house? or bring a different sweet? Hi Jill. You can definitely prepare this ahead of time. I normally do it in the morning and then put it in the oven as we eat dinner so that’s it’s nice and fresh when we eat it. Otherwise, you can also bake it and re-heat slightly before serving.